Nine in 10 enrollees in the non-group market say they intend to continue buying their own insurance even after being told that Congress has repealed the individual mandate penalty for not having coverage as of 2019, according to a new survey by the Kaiser Family Foundation. The survey finds the mandate, part of the Affordable Care Act, ranks low among the reasons people give for buying their own insurance in 2018. The survey also finds a lack of awareness about the status of the mandate penalty, with 1 in 5 non-group enrollees (19%) saying they are aware the penalty has been repealed but is still in effect for this year. The mandate continues to rank far down on a list of “major reasons” people give for buying their own insurance, below reasons such as protecting against high medical bills (75%), peace of mind (66%), or because they or a family member has an ongoing health condition (41%). At a time when the ACA is often labeled as “failing” by its critics in Congress and the Trump administration, the survey also finds that about half of the public say they believe the ACA marketplaces are “collapsing” (53%, up from 42% in January) — including 6 in 10 who purchase insurance through the marketplaces. 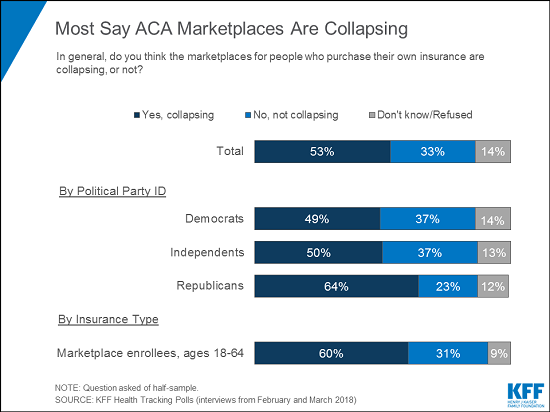 Across party identification and insurance type, more say the marketplaces are collapsing than say the marketplaces are not collapsing. Recent figures show that insurers in the marketplaces are now turning a profit, but repeal of the individual mandate penalty and other policy changes put forth by the Trump administration would create greater volatility next year. In addition, the poll finds at least half of non-group enrollees in general and marketplace enrollees specifically are worried about the future of health insurance availability and costs in their areas. 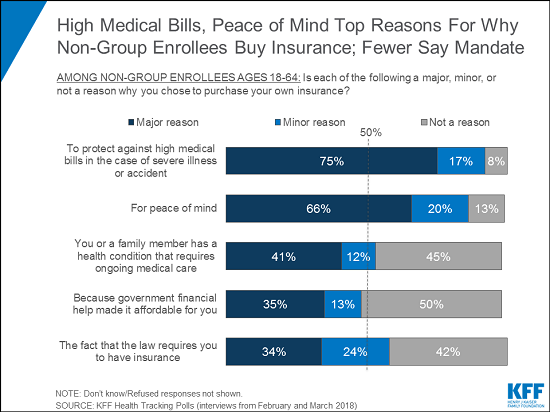 Fifty-one percent of all non-group enrollees and 58 percent of marketplace enrollees say they are “very worried” or “somewhat worried” there will be no insurance companies left selling plans in their area in the future, and similar shares worry that their current insurance company will stop selling plans in their area (49% and 58%, respectively). 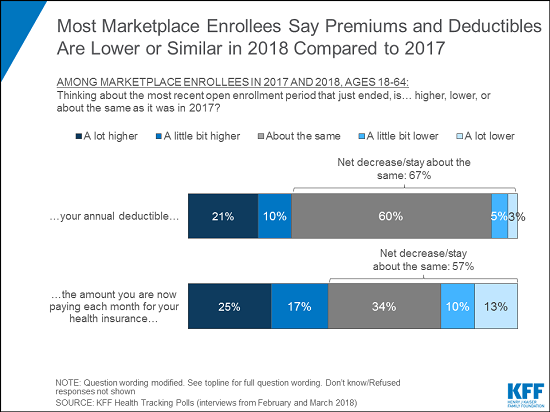 When asked about their own experience, however, most marketplace enrollees say their premiums have not gone up in 2018. One-third (34%) say their premiums are “about the same” as last year and a fourth (23%) say their premiums went down, while four in ten (42%) say their premiums have increased. These breakdowns are similar to the share of the overall non-group market who say their premiums have increased (46%), stayed the same (35%), or decreased (18%). In the marketplaces, this is likely attributable to the federal tax credits most enrollees receive to help cover premium costs and protect against steep increases. It also may reflect a “silver loading” strategy in which many states, concerned about the possibility of large premium hikes due to the loss of federal cost-sharing reduction payments, concentrated insurers’ premium increases on the silver benchmark plans that help determine the level of federal financial assistance available to enrollees. The majority of marketplace enrollees (60%) say their deductibles are about the same as last year. Three in ten saw an increase in their deductibles and few (8%) say they experienced a decrease. In addition, a majority of marketplace enrollees (61%) say they were satisfied with their insurance options for 2018 and most (68%) said they did not experience problems during the open enrollment period. The survey also finds little appetite among current marketplace enrollees for the non-renewable short-term insurance plans that President Trump has recently sought to expand access to through an executive order and newly proposed regulations. Such plans tend to cost less than ACA plans but provide fewer benefits, and are exempt from ACA requirements that insurers accept all applicants and cover pre-existing conditions. 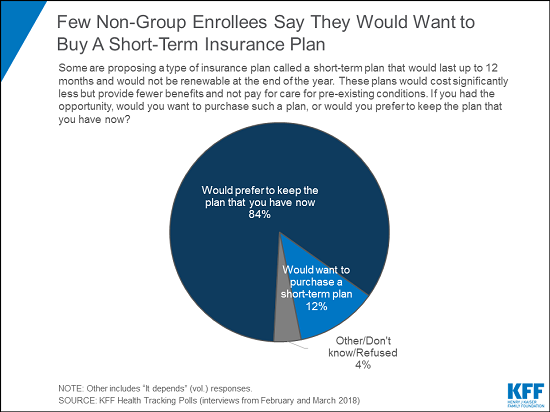 When asked whether they would want to purchase such a plan or keep the plan they have now, the vast majority of non-group enrollees (84%) say they would keep the plan they have now, while 12 percent would want to purchase a short-term plan. Responses were similar among individuals living in households both with and without pre-existing conditions. The new survey examines people’s experiences with the current health insurance market focusing on individuals who have health insurance they purchased themselves in the non-group market. It also compares the experiences of these individuals to those people who get their insurance through their employer as well as those who do not have health insurance coverage. The survey was designed and analyzed by researchers at KFF. Telephone interviews were conducted from February 15-20 and March 8-13 among a nationally representative random sample of 2,534 adult U.S. residents (882 via landline and 1652 via cell phone), including an oversample of respondents who purchase their own insurance (Non-Group Enrollees). The margin of sampling error is plus or minus 2 percentage points for the full sample, plus or minus 7 percentage points for all non-group enrollees, and plus or minus 9 percentage points for marketplace enrollees. For other subgroups, the margin of sampling error may be higher.